Here’s one of the biggest non-shockers of the year: casinos love you. Land-based casinos and online casinos alike want you to choose them over the competition. They want you to gamble with them, tell your friends about them, and always be #1 in their world. To ensure that you remain virtual BFFs with your casino of choice, the industry has created loyalty programs, and they tend to be very effective. In a nutshell, they reward you for gambling with them. But it’s not necessarily about choosing them. It’s about winning and losing — at least that’s the case in the live world. You see, online casino loyalty programs and live casino loyalty programs are very, very different. In fact, it’s safe to say that online casino reward programs are a cut above their land-based counterpart. Today, we’re digging deep to show you why. When you sit down to play Blackjack or any other table game at a live casino, you’re essentially relying on the pit boss to keep track of everything. If you have a player’s card, he’ll ask for it, make a note of how much you bought in for and at what time. And when you leave, he may track that at the table too. However, these times are often an estimate as the pit boss might not be there right away to accept your card and he may estimate your departure time if he’s not there when you pick up and leave. What’s more, it’s not always clear how much you won or how much you lost along the way. In the online world, however, everything is tracked. 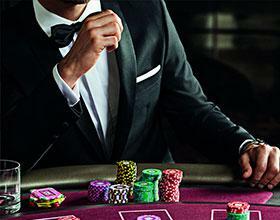 Online casinos know exactly how much you’ve deposited and subsequently how much you’ve won or lost. That means an online casino can slot you into an accurate loyalty program tier the second it happens. It doesn’t get anymore accurate than that. Land-based casinos like to keep track of how much you bet. You can bet $1,000 in a single sitting and be valued more than someone who has bet the same amount collectively on multiple visits. But in the online world, casinos really value loyalty. And many rewards programs reward players for frequent play, in addition to how much they’ve wagered. For example, while moving up the loyalty program might require you to wager a certain amount over time, it’s not uncommon for online casinos like Palace of Chance to surprise regular players with unexpected bonuses. Losing stings, but less so when you play online. Again, because an online casino can track how much you’ve lost, it’s easy for them to cover you with insurance on your losses. That means if things don’t go your way, you can earn a bunch of money back. On the contrary, at land-based casinos, they don’t really keep track of your losses that well, at least as far as accuracy goes. A live casino can only estimate how much you’ve lost but they lack the data to back up those numbers and report them as fact. That’s why, for the most part, land-based casinos won’t offer you insurance. Instead, they’ll offer you things like comped rooms or free steak dinners based on how much they think you spend on an average visit. If you’re a member of a land-based loyalty program, there’s a good chance you receive monthly emails offering you a discount stay at the casino hotel, or a promotional email advertising upcoming concerts. But to receive things like free casino chips every month? That’s just unheard of. But in the online world, free chips and other monthly surprises are a regular occurrence. And the higher your rank in the loyalty program, the more you’ll earn. When you first get your loyalty card from your favorite land-based casino, you’ll likely head over to their website to see what incentives are in store. And usually, they’re not very good. But the second and third tiers are often fairly decent. Unfortunately, making your way to those tiers is really difficult, unless of course you’re a high roller. Contrast that with the online casino world and it’s easy to see why more and more people are asking their favorite live casino to mimic the online world. In internet casinos like Palace of Chance, rank advancing happens rather quickly. For example, we’ll keep track of your total deposits and slot you into the next tier the moment you hit the required amount of money. There are no hoops to jump through. No emails to send. Everything is automatic. The Palace of Chance loyalty program consists of four levels—Jade, Pearl, Ruby, and Diamond. You’ll enter the VIP program as a Jade member as soon as you’ve made $5,000 in total deposits. That entitles you to a $250 Welcome Free Chip, 20% monthly cashback, more monthly free chips, and a lot more. If the $5,000 in deposits seems like a lot for an entry tier, keep in mind that our entry tier entitles you to way more rewards than some of the highest tiers of competition loyalty programs. What’s more, even without joining our loyalty program, you’ll qualify for lots of monthly incentives and special promotions based on your play. To join the loyalty program, you’ll need an account. It’s totally free to set one up at Palace of Chance and doing so gets you access to the free games, including all your favorite slots and table games. To climb up the ladder in our loyalty program, you’ll need to make a deposit and play. You can do that from the Cashier using a number of different payment methods. Plus, with your first deposit, you’ll get even more to play with. Check out the promotions page at Palace of Chance for all the details.